The tie to Palm Springs, California goes back 3 generations with the Kladder family. It all started with Jeff's grandparents Peter and Arlyne who vacationed there with friends in the wintertime, some of whom still live there seasonally today. Now, Jeff's parents (Tom and Mari) and his Aunt Sue and Uncle Bob spend time there during the colder months, and his Uncle Steve and his partner Samuel live there year round. And lucky us, the kids and grandkids are invited to visit regularly. Needless to say, the tradition Peter and Arlene began still lives on today. Our first full day in town we visited Jeff's Dad's favorite spot: The Living Desert Zoo & Botanical Gardens. The gardens are incredibly maintained and great for walking with a stroller. But the show stoppers for us were the animals, especially the cheetah run. Twice a day the zoo keepers toss meatballs (for real) into the cage as a treat for the animals and also to display the cats incredible ability to go from zero to 60 mph in only seconds. We also enjoyed the giraffs, big horned sheep and the zebras (aka the 'horseys' according to Natalie). 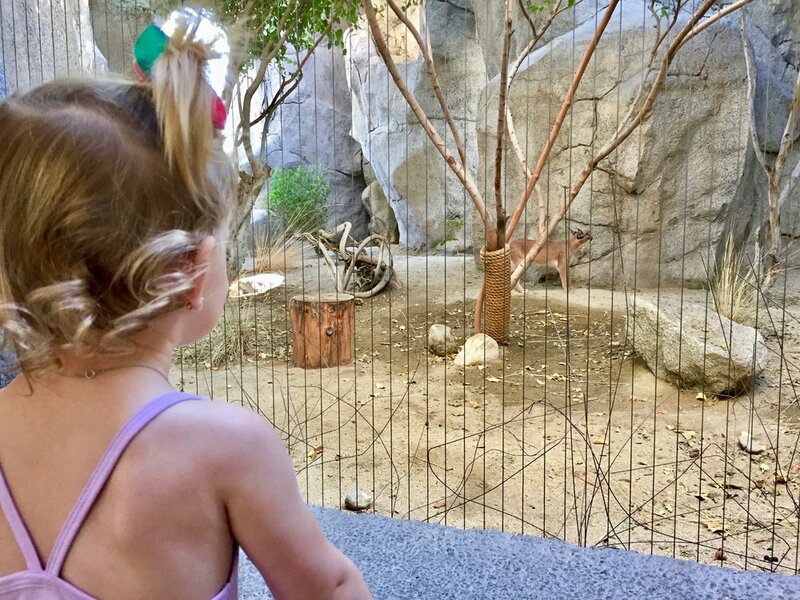 The zoo was followed by lunch at one of Palm Springs most popular hamburger places, Tyler's. Their burgers were tasty, their fries were fresh and their coleslaw was certainly something to write home about. I was super sad to miss tasting the potato salad - they were out! Next time. Nat shared a strawberry shake with Grandma and Thomas slept through the entire meal. We enjoyed every minute (and calorie). Sharing a strawberry shake with Grandma at Tyler's Burgers in Palm Springs, CA. That same night Jeff's parents gifted us the night out solo to celebrate our 4th wedding anniversary. It's been 4 years of one fun thing after another and my goodness I love that man. We toasted martinis at Copley's, a great spot downtown with fantastic outdoor seating. They are known for their manhattans and they did not disappoint. After dinner we took an Uber to the Ace Hotel & Swim Club for a night cap. We sat poolside and enjoyed the night air from our corner table chatting about our kids and life and how quickly time has flown by. Friday morning Jeff and his dad played 18 holes at Escena Golf Club. Jeff golfed his best score of the season and so it goes without saying, he had a great time. While the gents golfed, Mari and I went downtown Palm Springs with the kids for a little shopping. We mostly found souvenirs and sweets! Later we met up with the guys for lunch at the clubhouse for salads and sandwiches. The food was good but the view from our table was even better. There are no words that can describe nor photos that can depict the scenery in it's true majestic beauty - you just have to go see it for yourselves! That night Mari prepared the best steak dinner for everyone and Jeff's Dad opened a bottle of wine in honor of our anniversary. It was the best meal we shared together all week and I would attribute this to the delicious food and drink, but mostly to the conversation. The strength of their partnership is one to emulate and we are grateful to have the two of them as part of our foundation. On Saturday we took our second field trip to College of the Desert (COD) which is quite literally, a college in the desert. But on the weekends a portion of the campus is taken over by the street fair. There you will find art, jewelry, produce and so much more. It's a flea market of sorts and excellent for treasure hunting. I found a dress and Jeff bought a wallet and some new sun glasses. Mari picked up some asparagus (you never can have too much!) and Jeff's Dad devoured an apple fritter. It was an excellent way to spend a Saturday morning. That afternoon we laid by the pool soaking up the rays and playing in the water with the kids. If the photos aren't telling enough, the pool there is quite possibly what heaven must be like. After relaxing all afternoon we headed for Cabazon to the outlet mall. You want it, they've got it. In order to see the entire stretch of stores we stayed well past the kids bedtime which was well worth it because we made out with some great deals. Sunday morning we rose bright and early for the trip I was most looking forward to: Joshua Tree National Park. Approximately 45 by 30 miles worth of desert that reminds you of a mix between the surface of planet Mars and a Dr. Seuss book. I'm not kidding, if Thing 1 or 2 would have popped out from behind a rock I would have thought, "Oh, for sure, that makes complete sense." The rock formations were incredible and the vegetation was so starkly different than what we're used to here in the midwest. Jeff and I put the kids on our backs, Mari packed us a picnic lunch and we made a few hikes into the desert to get a closer look. It was a very memorable experience. That night we tried El Mirasol, a Mexican restaurant downtown, for dinner with the kids and it was terrific. 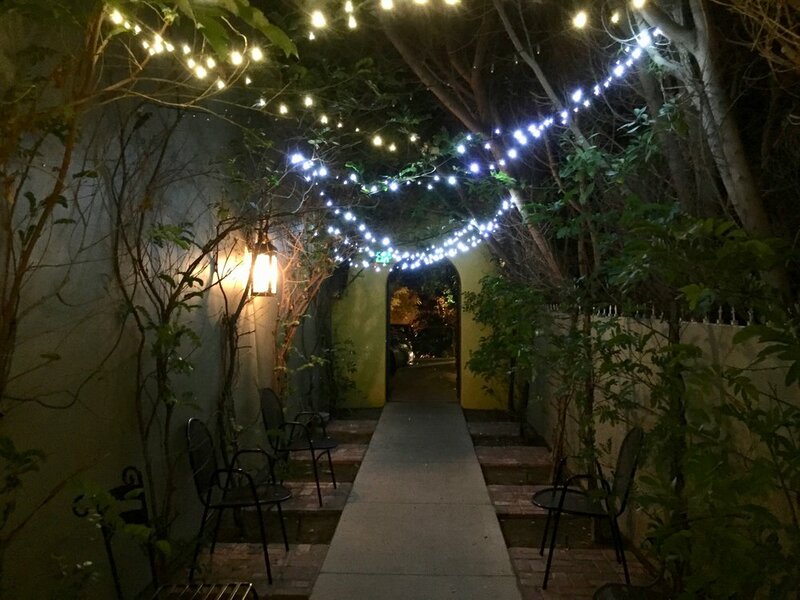 Tucked in a small courtyard off the main drag we found cafe lights and endless chips and salsa. It was here that we realized Natalie is completely capable of fending for herself while eating out as we watched her, dumbfounded, order herself a, "Chocolate milk and a taco please." My heart melted with pride and I was half tempted to follow with, "Make that two!" But I really wanted a margarita. El Mirasol Mexican Restaurant in Palm Springs, CA. On Monday the guys hit the golf course again and Mari and I hung out with the kids by the pool. It was a true 'vacation' day as we did absolutely nothing all day long! We had plans to ride to the top of the mountain on the Tram but quickly decided we'd save that adventure for another trip in order to stay lazy by the pool for a few more hours. Our last full day in Palm Springs Jeff's Dad took us on a walking tour of the Movie Colony Neighborhood. 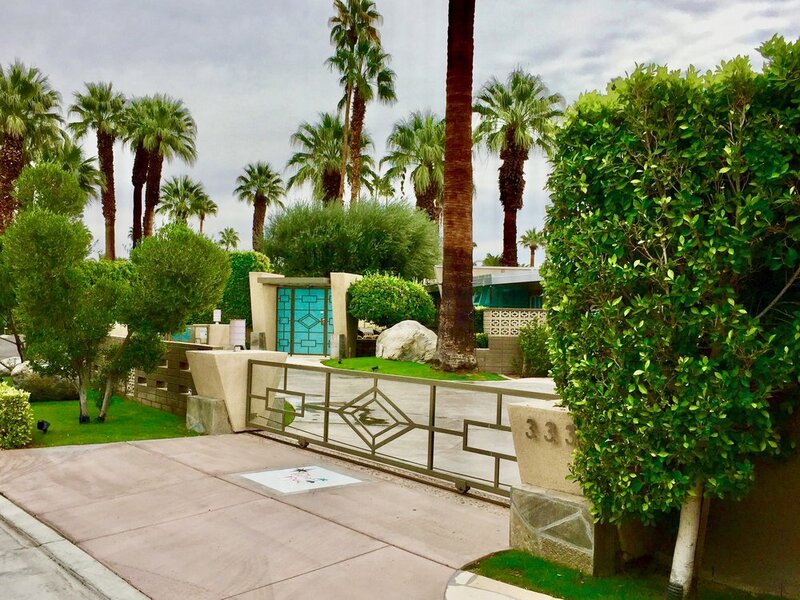 It's a mix of Spanish Style and Mid Century Modern architecture and stars such as Frank Sinatra and Bob Hope once called this neighborhood 'home.' They are massive estates including pools, tennis courts, putting greens and some of the most beautiful landscaping you ever did see. This walking route is part of Jeff's Dad's morning routine and he served as our guide. Thomas fell asleep and Natalie ate snacks. Fun was had by all. Our last evening in Palm Springs we dined out at one of my in-laws favorite spots: Al Dente's. It's an Italian place right on the main street with a great little private, outdoor room with a table that was perfect for our party of 4 plus a toddler and a baby. We enjoyed the seafood dinner special and vodka gimlets as our week in Palm Springs came to a close. I'm a Midwesterner to my core and always will be, but I'm starting to believe that a small part of my heart was left in Southern California. But just to be sure, ask me again when our temps are above freezing again! Palm Springs was a great place to spend time with family. We had 7 busy days there and left more on our list to see for next time. We'll certainly be back!